Join the Foodjini.com team and start benefiting from our state-of-the-art web site and expert marketing We have many different programs to offer. Please speak with an account representative to find out what’s best for you. Manage your Restauarnts online from anywhere, by using the Online Foodjini Dashboard. Maintain a complete week's schedule using the daily open-close timings setup. Restaurant can support any or all of the delivery types...Pickup, Delivery, Curbside. Restaurant can offer any or all Payment Options...Cash, Credit Card, Paypal. Directions to the Restaurant will be shown on Google Map in the Restaurant's information tab. Delivery can be confined to a pre-defined Delivery Area setup by the restaurant. Receive Orders instantly on your choice of - e-FAX, Email, Blackberry, or SMS Text messaging. Foodjini Customer support will ensure smooth sailing. Have your own, branded, private-label, ordering space on the web! 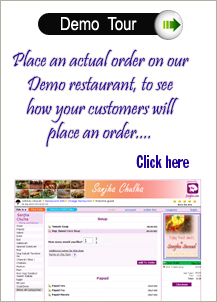 Enable your customers to order Online without having to wait on busy phone lines, or having the menu read out to them. SMS and Mobile Ordering also available now! You can be listed on your City's Food Court if you wish. Or Tie your existing website to the online-ordering platform. Test the Customer's Expereince...place an order on our Demo restaurant. Serve your customer better. Increase your Sales through your online presence. Enhance Corporate ordering on your restaurant by offering them the ease of use of the web. Leverage the web data to identify key sales areas, and percieve how to enhance sales. Avail Special Introductory offers! Details available on request. Click here to send us a request.